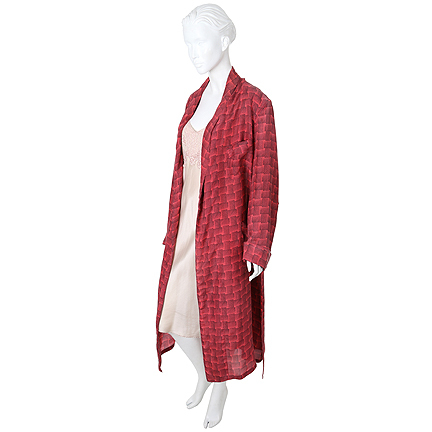 This costume was worn by the character “Wanda Wilcox” played by actress Faye Dunaway in the 1987 film, “Barfly”. 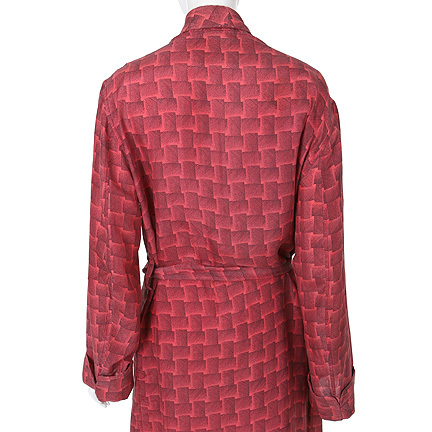 The robe is constructed out of a red silk material with a repeating woven square pattern and the left shoulder has evidence of a minor tear which has been repaired. 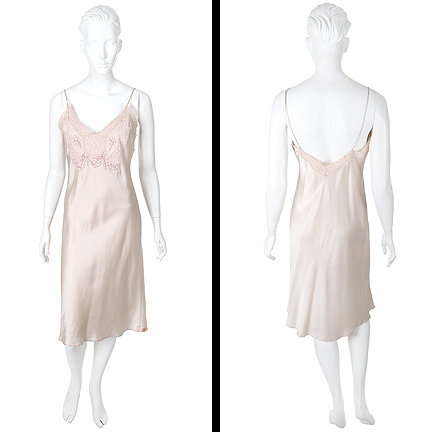 The calf length nightgown is also constructed of silk with lace bodice. 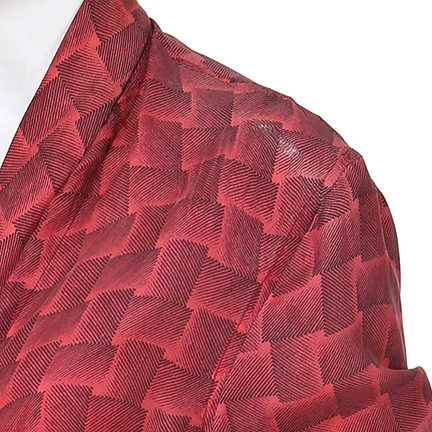 Ms. Dunaway can be seen wearing these garments during several scenes throughout the film. 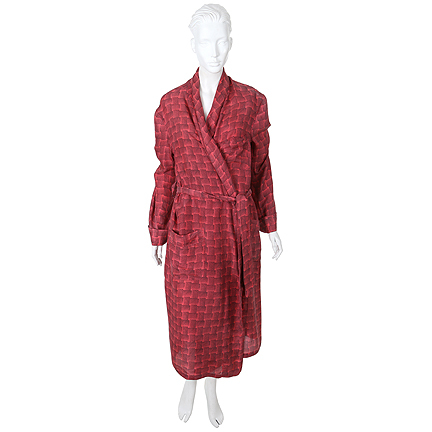 The robe is most notably seen when Wanda Wilcox gives Henry Chinaski (Mickey Rourke) an extra key to her apartment after they share a night together. Henry compliments her beautiful legs telling Wanda that they attracted him first, but Wanda insists that she is too dependent on alcohol and would leave him for another man even for “a fifth of whiskey”. 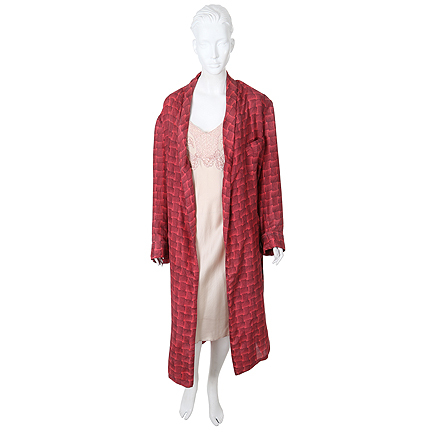 Later in the film, the nightgown is most prominently seen when Henry shows off his five hundred dollar advance from a book publisher, and Wanda changes into an evening dress before the two go out to a bar to celebrate. 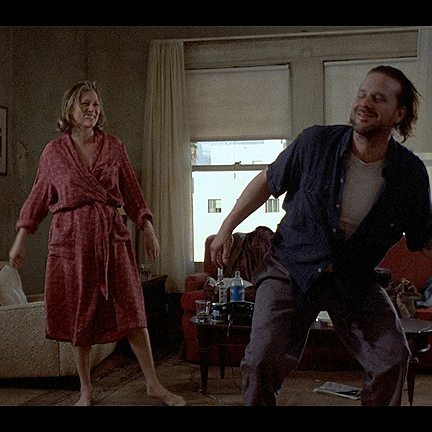 “Barfly” was directed by Barbet Schroeder, written by Charles Bukowsi and presented by Francis Ford Coppola. 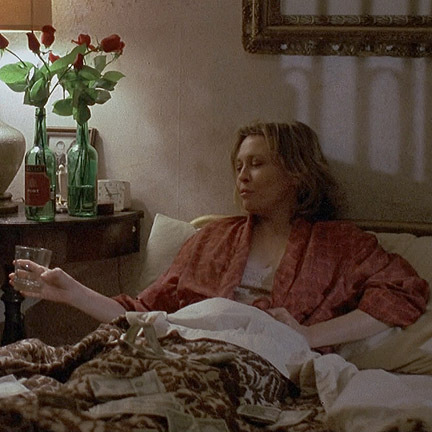 Starring Mickey Rourke and Faye Dunaway as two destitute alcoholics living by the bottle, this film is a semi-autobiographical portrayal of the poet/author Charles Bukowski and his struggles with alcohol while living in Los Angeles. Faye Dunaway was nominated for a Golden Globe for Best Performance by an Actress. These garments are in excellent screen worn condition and are accompanied by a letter of authenticity from the costumer.